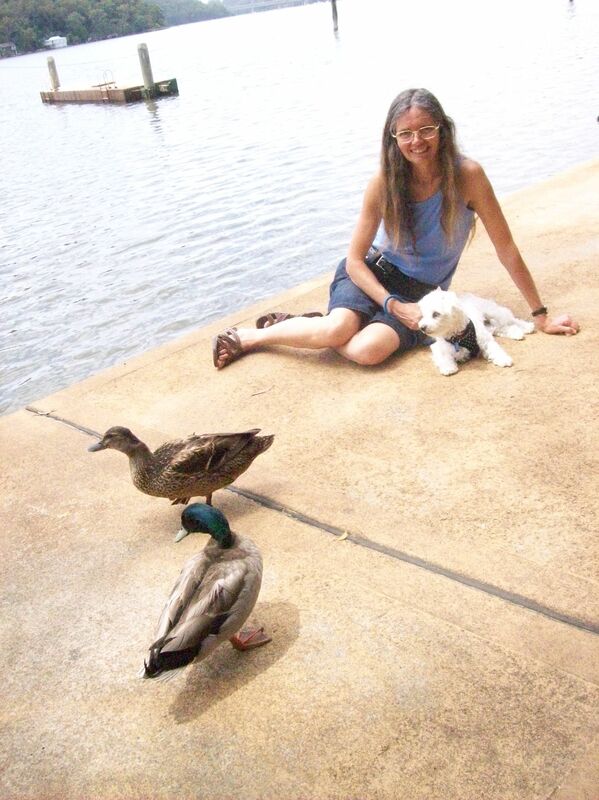 You’ve seen the images…..Chicki and me, late last summer, down by the river. Chicki was in her short summer clip, freshly trimmed up for our summer heat. The river, cool and refreshing, is home territory for a small group of wild ducks. Sometimes, a little family of ducklings swims along, behind them. This is where I love to be. In summer I brave the water, sometimes even in the rain. In winter, it’s a wonderful place, just to relax and stroll around in. It’s hard to believe that Sydney is not so far away. The day started well, with my discovery of a lovely review by Goodreads member Mark. Overflowing with praise for my writing style, he goes on to lightly sketch some of the stories. It turns out his chosen ones rank amongst my favourites. A defining feature of my ‘Life and Love’ series is the link between the first and last stories, and Mark has brought this out effectively for this volume. It’s so nice to know that my first effort, written almost two years ago, is attracting such positive attention. It’s only weeks ago that Jeanette, another Goodreads member, also reviewed and rated it identically. It couldn’t have happened at a better time, with me still recovering from influenza. It’s a great shot in the arm! Yes, another 5 star review! What’s Good About Being Sick? Being currently in the concluding stages of influenza, I can vouch: very little. Sickness is a blight: it richly deserves its abysmal reputation. Apart from all the discomfort and misery it brings by virtue of symptoms, it carries with it an additional burden: inability to work. Result? A huge backlog of toil, ready and waiting for the victim’s recovery. Something to look forward to? Seriously, though, there is something positive in the sickness experience. How absolutely wonderful it is to get well! A simple treat becomes magnified in its enjoyment. Nerve-racking though they can be for an awaiting author, reviews are, in general, immensely valuable. I say in general, since clearly, there is a relationship between the skill of the reviewer and the value of his or her review. Nevertheless, all reviews are capable of, at the very least, providing food for thought, for both sides of the coin. Though reviews are, I presume, primarily for the benefit of prospective readers: what author can truthfully say they are quite disinterested? Human nature is typified by a hunger for approval. What joy, what comfort, a word of praise can bring! For an unknown author, these few words may be all the reward they get for months, even years, of effort. On the other hand, if there’s room for improvement, how vital it is to be steered in the right direction! For readers, choosing a book can be made much easier by the words of guidance of an intelligent reviewer: particularly, one on your own wave-length. What time, disappointment, and money can be saved, by following the wise advice of another. Congratulations to all good reviewers! You deserve it! What do you love about reading? There’s so much to choose from: its value runs through many strands . As a source of information, it gives us the chance to find out so many things, in so many topics. Health, sport, society, history, religion, economics, politics: you name it, it’s been written about. And the beauty of the written word is that so easily it’s there to go back again and again, at our will: to savor, to reconsider, to imprint into our minds. For many, reading for enjoyment forms a cornerstone of their lives. When we read, we focus on something else: sometimes, something quite out our own personal experience. The writer’s skill is often tested and measured by the degree of empathy they engender. Evocation, too, is another critical component. Focusing on something outside our own lives can be, and I dare say often is, therapeutic. Released from its burden of care and worry, even if only briefly, our minds are given a chance to recover and, later, re-focus on our own problems. Perhaps our reading has shed light on a new insight into relationships, which are sometimes fraught with difficulties. Who know what we will unearth, on any topic? Finally, reading gives us the chance to know intimately the minds of great and educated people. We can marvel at the beauty of language: the importance of word order as a tool of evocation. We can (almost) live the lives of people, past and present, in cultures like ours, or quite dissimilar. To instil a love of reading into the minds of our children is surely one of the greatest gifts a parent can deliver. Wait for it: Another review! More good news! Shelleyrae at Book’d out, one of Australia’s leading, respected book blogs, has accepted my sixth published work for appraisal. She’s literally booked out, and so the collection is scheduled for next year: February, in fact. I’m absolutely honoured and delighted that she has accepted this volume, especially since she has already reviewed this year, my second work, ‘A Taste of Life and Love in Australia’. February: the month for lovers. Valentine’s Day. February: the month for the review of perhaps my very best effort to date: Long and Short Australian Stories.